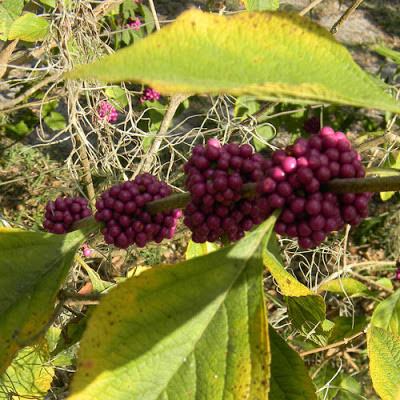 That's the American Beautyberry, also known as Callicarpa americana. For some reason, everyone thinks they're poisonous. Perhaps it's the brilliant color of the berries or the pungent smell of the leaves. Fortunately for us, however, they are edible. They're not the best-tasting thing in the world, being mealy and sometimes slightly reminiscent of turpentine... but they're safe as milk. And apparently, they make a good jelly. 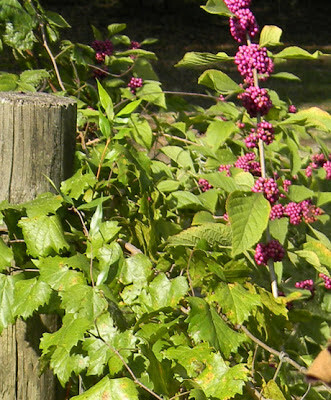 I've allowed beautyberries to grow all around my yard and I've also deliberately planted them around my chicken run, since I've noticed the chickens love them. When I remember, I grab clusters off the bushes and scatter them for my hens. Free food! For some reason, my kids also love beautyberries. They do a game they call "Snacky's Diner," wherein they gather up beautyberries in jars, then serve them up as if it was a restaurant. Occasionally, they'll also yell across the yard things like "Snacky's Diner is OOOOOPEN! COME ON IN!!!" You might plant these babies and try the same thing when you have company over. Hmmm... I thought they're poisonous :) Thanks! I used to wonder about their toxicity as well. Anything that purple is a bit suspect in my book. Thanks for stopping in... let me know if you make anything cool with 'em. That's a good start. I still have clusters of berries on the ones by the pen... actually chucked some more to the chickens yesterday. I made some apple cobbler and put some in them. It was ok . Only the berries are edible? Not the leaves right? No report on leaf edibility - though they're reputedly bug repellent.